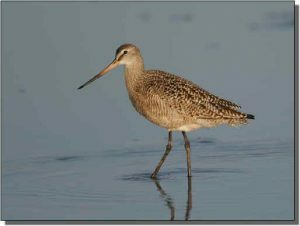 Description: The Marbled Godwit is a large, crowsized shorebird with long, dark legs and a long, slightly upturned, bicolored bill. The entire body is buffy orange-brown including the tail and underwing linings. During the breeding season, underparts are barred, they show a dark brown back and have a heavily patterned neck and head. During the nonbreeding season, barring on the underparts is lacking. Females are larger and have longer bills than males. Similar Species: Hudsonian Godwits have a distinctive bicolored wing pattern in flight. Often seen in close association and similar in coloration to Long-billed Curlews, Marbled Godwits are slightly smaller and lack the long, decurved bill of curlews. Willets are smaller, stockier and have straight, stocky bills and blue legs. Dowitchers are smaller with straight or slightly down-tipped bills and shorter legs. 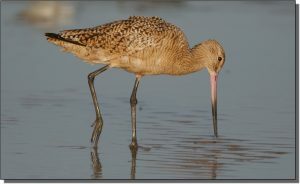 Comments: Marbled Godwits breed on the grasslands of the northern Great Plains and spend their winters in coastal areas. They feed by slowly moving across mudflats and probing deep under the surface for invertebrates.